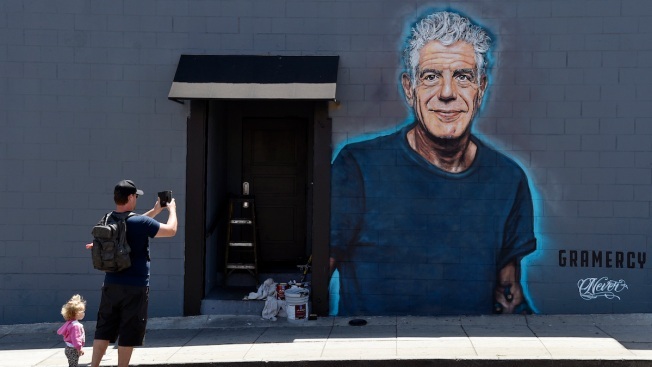 Food writer Hadley Tomicki of Los Angeles is accompanied by his daughter Kira, 1, as he takes a picture of a new mural of the late chef/writer/television personality Anthony Bourdain by artist Jonas Never, Monday, June 18, 2018, in Santa Monica, Calif.
Two weeks after Anthony Bourdain's tragic passing, new information is surfacing about the acclaimed chef upon his death. The Parts Unknown host only had a "trace of nonnarcotic medicine in a therapeutic dose," in his body at the time of his death, local prosecutor in charge of the investigation, Christian de Rocquigny, told The New York Times Friday. On June 8, CNN confirmed Bourdain's passing, stating that his cause of death was suicide. "It is with extraordinary sadness we can confirm the death of our friend and colleague, Anthony Bourdain," a spokesperson for the network said in a statement at the time. One week after his death, Bourdain was cremated. A CNN spokesperson confirmed the news to E! News on June 13 and added the family asks that their privacy please be respected. Following his passing, many of Bourdain's loved ones and colleagues took to social media to react to the heartbreaking news. Among those mourning his death, his longtime girlfriend Asia Argento. "Anthony gave all of himself in everything that he did. His brilliant, fearless spirit touched and inspired so many, and his generosity knew no bounds," Argento wrote on social media. "He was my love, my rock, my protector. I am beyond devastated. My thoughts are with his family. I would ask that you respect their privacy and mine."